We had a very relaxed and fun weekend with half of our kids and my Dad. The sun was out, the food was great, the company was most excellent.... we even passed the phone around with our other Son and daughter-in-law... so that it felt as if they were with us. That was as good as it can get. We hope that you also had a wonderful Holiday, and if this is one that you do not celebrate.... at least, we hope that you had a wonderful weekend. I still have not gotten the bug to draw or paint. When I do, I promise to share. Artists from Brazil showing there stuff in Florida! 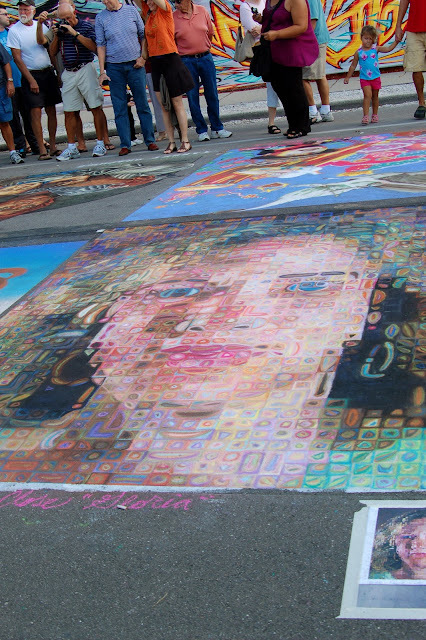 Several weeks ago, we went to the Chalk Art Festival and enjoyed many Artist's work. 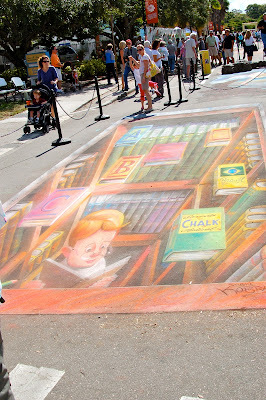 Several artists came from Brazil and created one of the most endearing chalk art works of the show. Only problem, is that I didn't show it on the blog because my photo didn't do it justice. At any rate, the Brazilian artists were asked to stay in Florida and create a mural on the side of an apartment building. We happened to be at lunch across the street and were watching them work. Within two weeks of the show, they had created this incredible wall art. I just had to share it with you. So, enjoy. These artists are hoping to break into the Art Market in the United States.... I sure hope that they make it. Hope you had a wonderful Thanksgiving.... we certainly did. ....reminds me.... time for some pumpkin pie. Where did this exciting work happen??? an area filled with fun shops and great art. The Artists created the most endearing work. The sun was too bright to really capture the work well. The Artists at work during the Chalk Festival. A new commission for the Artists from Brazil. This is a three story building! that will be enjoyed for many years to come. I look at all of the vegetation around me and wish that I could pick up a paint brush. However, I have been painting.... just not the kind of painting that creates a picture. I have been trying to restore a console...which was truly a wreck and a horrid color. As one neighbor said.... you are making it 'sort of shabby chic'. Well, that is as good as it will get.... shabby, mostly, but hopefully a refreshing shade of creamy white with turquoise interior. It's beachy for sure. The detail of this was amazing. We never did find out which one won! next photo will tell you why. they are having a yard sale, too. right now. I love the way he made this statement sing out loud. Last weekend, was the Sand Sculpting competition. from several hundred yards out in the Ocean. was put into a GPS. wonderful ideas to honor our soldiers. You never know just who you will find on the beach. Love this fellow.... made me smile! I just had to show you two more photos of the chalk art festival....because I loved them and forgot to put them into last weeks blog. Then, tomorrow, I will start showing the wonderful sand sculptures that we had a chance to see. I have not been drawing at all. I am reading the most wonderful book about "The Creative Habit - learn it and use it for life" by Twyla Tharp. It is an amazing book that every one should read, if they want to think creatively or they need a booster shot for their creative spirit. She applies all the arts (as well as business) into this book. I would love to have my kids read it (creative beings that they are..... think they would love it). Okay... photos for a while.... then, I hope to get back to some interesting work and share it with you. quite as well to a photograph. Today we headed for the beach, to the Sand Castle Festival. Twelve sand master teams (2 per team) were invited from all over the world, to compete in sand sculptures. It's hard to be amazed, after the chalk festival.... but we were, for sure. Many sand Masters come from the Netherlands, which was a surprise....however, many countries were well represented. The interesting part is that many of the sand masters have degrees in Architecture or Art & Design (sculpture) and they also work in ice and snow sculptures. I have not downloaded those photos.... but I will share them next week. 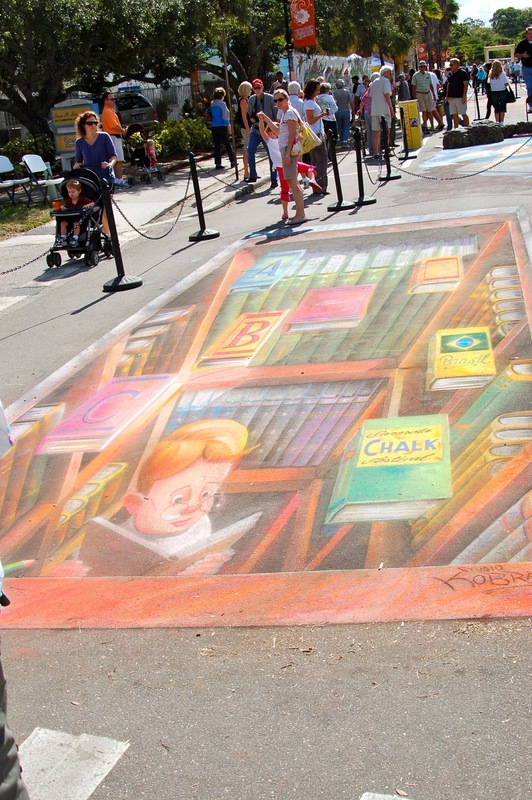 Until then, you will have to delight in more chalk drawings. Oh my, it's a feast for the senses, and it's not even Thanksgiving, yet!! Tomorrow.... we are headed to a concert, where my daughter-in-law will perform on the Saxophone. I am excited to hear the Band in their town, at their Civic Center. My soul is filling up quickly. Her chalks were the most vibrant of the Festival! working from the art of Stephen Bennett. I like the subject matter, as well. The detail on this was extraordinary. We are warming our bones in Sarasota... yes, that is Florida! It was the break that I needed and it fills my spirit to be warm, and nearer to at least half of my kids. The other half are in Portland.... a cooler climate than I can handle this time of year...but we plan to head up there too, when it's warmer. There are many festivals down here.... wonderful and creative things to do each week. Last weekend, was a Chalk Festival with artists from all over the country creating chalk drawings on the streets in downtown Sarasota. Seriously, they closed off the entire street in the historic district and Artists went wild with color and imagination. I did find out that they also have a wonderful Chalk Festival in Denver in the summer.... so I am definitely going to go to that next year! Well, I will just share the photos as they are amazing (not the photos.... the art work in the photos). The only sad part is that after the Festival, street cleaners come and wash the art away....completely!!! In previous years, they have allowed the art to remain on the street until it slowly disappears. There was such a ruckus about the street cleaners this year that they are NOT going to do that again (hopefully). Okay, you are patiently waiting for photos.... so here goes! which just fills you up with joy! I did need a break, but I can never stay away too long. These photos are a bit old, but I wanted to share the mess that we had in our yard, when a huge snow storm hit Colorado last week. Unfortunately, it took a huge toll on our trees, and this is what happened in our back yard. Hopefully, the snow will be gone and clean up can take place very soon. See you soon. I have lots to share. Last week we had quite a snow storm. We woke to a back yard that was a wreck. as we await clean up help. We left for a climate that is a bit warmer.